Absolute Grey - "Greenhouse (20th Anniversary Expanded Edition)"
Absolute Grey were a Rochester, New York based quartet that recorded and gigged in the mid 1980's. The band consisted of Beth Brown on vocals, Mitch Rasor on bass, Matt Kitchen on guitar and Pat Thomas on drums. Now because this is being reviewed in Aural Innovations I have to point out that the latter is the same Pat Thomas who has been drummer and band leader of the San Francisco based psychedelic-jazz-prog-krautrock outfit Mushroom that we've spilled so much ink on over the years. 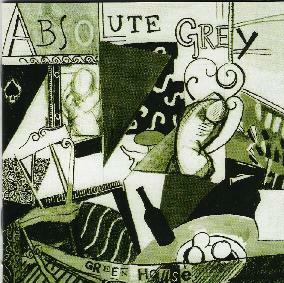 Greenhouse was the first of 5 Absolute Grey albums and the one that got the most distribution and press. The promo sheet refers to a neo-psychedelic folk rock jangle and influences of the 60's like Jefferson Airplane, The Byrds, Fairport Convention and The Velvet Underground, but also contemporaries like Echo & The Bunnymen and Julian Cope. Disc 1, the Greenhouse reissue, opens with "More Walnuts", a jangly 80's rock tune with guitars that reminded me of the Byrds. Fairly standard stuff for the times. Yet the rhythm section is tight and the guitar and vocals give a nice folk-rock edge to the music. But the rest of the CD is much more interesting. "Saving Face" and "Notes" are easier paced songs that retain the 80's sound while also showcasing the more psychedelic side of the band. What's interesting is the songs manage to stretch out… in a controlled, composed manner… without actually going off into freeform jams. "Sidewalk" is the longest at over 7 minutes, and Absolute Grey make good use of the time, keeping a good groove going, even getting a bit spacey at times, and Beth Brown does a good job of keeping her vocals ooooh-ing and grooving along. Grace Slick is about the closest analogy for her singing style. This is my favorite of the studio tracks. The Greenhouse set also includes 2 live tracks, and sure enough, like so many bands it's immediately apparent that Absolute Grey are really in their element when performing live. "Memory Of You" is a high energy rocker, tightly played but nicely rough around the edges. And their live cover of the Velvet Underground's "Beginning To See The Light" is an excellent example of Absolute Grey's knack for blending the rock of their contemporaries and the psych-rock of days gone by. And given the strength of the live material I dove eagerly into disc 2, which consists of 17 live recordings from three 1984-85 shows, and indeed the band really rock out on nearly all these tracks. The opening track, "Two Years A Handshake", is quite different, being a moody acoustic guitar song but also featuring Beth Brown's most expressive vocals. "More Walnuts", the song from the Greenhouse album that did the least for me, is full of rocking spirit when performed in a live setting. An enormous difference from the studio version. "Tell Me When It's Over" is a cover of a Dream Syndicate song and is an excellent psychedelic rocker. And throughout we get several solid rockers that have a raw thrashy edge but are cleanly executed by this tightly knit band. A really nice reissue package for fans of the 80's rock scene that at the time seemed (in the US anyway) to be dominated by all things Athens, Georgia. For more information you can visit the Absolute Grey web site at: http://www.absolutegrey.com.